Woke up with butterflies in my stomach. Why? I leave on the FORGE book tour in one week. I am probably better known as an author of contemporary YA novels than as a writer of historical fiction. This bums me out a bit. I adore working in both genres and feel they are equally important. What makes me sadder is the bad rap that historical fiction gets from readers. The phrase itself makes kids bolt for the exit or writhe on the floor in agony because between Johnny Tremain and the excruciating boredom of history class, they think all things historical are worse than chewing on barbed wire. 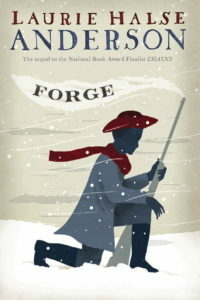 Don’t call FORGE, CHAINS, OR FEVER 1793 “historical fiction.” Call them “historical thrillers.” Why? That quote is from my guest blog about historical fiction over at Rasco from RIF. Read the whole thing, please, and come back here to tell me what you think. Historical fiction or historical thriller? You are an amazing author! Congratulations! I don’t think you’re going to get the perceived negative connotations away from the word ‘historical’ unfortunately, even by adding ‘thriller’. Even aside from bad associations with boring school history lessons, teenagers in particular are geared up to rebel against the past. Fairly or not, ‘historical’ implies ‘defined and finished’ while ‘fantasy’ implies something inherently open and forward-looking. Perhaps the genre would fare better under a euphemism, but I’m not sure what! Over here (UK) the received wisdom is that you can only publish books that are set in periods covered by the history syllabus of the National Curriculum, and they’re not really sold as historical fiction, just fiction. That said, Celia Rees is one UK author who has a nice line in writing about suitably thrilling historical subjects (pirates, witches, highway robbers). It’s just not really a genre in itself , or not seen as one. I love historical fiction, but it is a hard sell to get my students to read it. I’ll check with them today on library day and get their feedback on historical fiction versus historical thriller. Everything we do, everything that’s happening now, is just a repeat of the past. Love, passion, intrigue, corruption, plague, war… it’s all been done before. But I find books set in the past to be so atmospheric… all those gowns, corsets, velvet, and candlelight. What’s not to love?! Best of luck with the Forge tour, Laurie! Historical fiction is a bridge that connects the window of what once was and what is. It touches on the connections and commonalities we have with those who lived before us and those who we live among. What could be more thrilling? Being a history major, I always adored historical fiction. But, I agree, it has not been very popular the past couple of years. (Seemed to have a bit of a upswing in the late 1990s in publishing, but is quieter now.) I like your re-definition. I am also excited to read your new book! Good luck on the book tour. Nonfiction books like Erik Larsen’s Devil in the White City, Stiff by Mary Roach, Michael Lewis’s Moneyball , Name all the Animals by Alison Smith (which is awesome by the way)… they used to be sold sorta dryly as history, science, economics and autobiography. Now they’re presented as murder mysteries, memoirs, inside sports, and in the case of Stiff, cadaver comedy. They’re still history, science, economics and autobiographies, but I think readers come to them with the additional expectations that the books will not only be informative, they will also be really good reads. For some reason, readers don’t automatically expect that Historical Fiction promises a good read. A stamp on the spine that says Historical Thriller might change that. Best wishes for fun, smooth and safe travels. Hope to see you in Pennsylvania! I love historical fiction. I think it really opens doors, especially if you read a novel on a whim. Chances are you’ll want to look up what really happened and it will kind of create a snowball effect. I understand more about things like politics, architecture, etc from research I’ve done after reading one novel about Tudor England. I read Chains for the first time last week in one sitting. It was awesome! I can’t wait for Forge! I hope you have a blast on your book tour! I completely agree with you, Laurie. I think the potential for historical fiction in the YA world is huge. Of course, I’m a little biased because it’s what I write :). Even in the adult world, historical fiction has a bit of a bad name. That’s despite having several great examples (Wolf Hall comes to mind) that have won big awards. I think people get confused about Historical Romance, assuming that everything that says Historical is going to fall into that category. In YA, maybe it’s that they read “historical” and see “boring history”. Forge is a wonderful, meaningful, thrilling book. I hope it knocks it out of the park! Historical fiction isn’t my top genre, but I like to celebrate exceptional historical fiction. I think when historical fiction is done right, it can make readers excited about learning about history. I loved Chains. And while not straight out historical fiction, I loved the history-based sections of Zetta Elliott’s A Wish After Midnight and Jennifer Donnelly’s Revolution. Reading Chains and A Wish After Midnight in close succession made me incredibly interested in what it was like in New York City during both the Revolutionary War and Civil War for black Americans and in particular for young black women. I especially appreciate historical fiction told from the perspective of characters whose perspectives are often ignored or merely glanced upon in history textbooks. Unfortunately, I sometimes think the kids I know hear the words “historical ficiton” and see either Little House books in their minds, or text books. sigh. You and other great historical YA fiction authors (like Lisa Klein) are doing the world a favor by making historical fiction accessible and just as enticing (once the kid gets over the label) as contemporary or fantasy YA works. Congrats on your starred reviews!! As a middle school librarian, I find that my greatest impediment in selling historical fiction (or thrillers!) to students is the jacket art. My students are great readers but steadfastly shy away from books with old fashioned looking covers. I can usually beg my frequent flyers to “just trust me” and give the books a chance, but I have very little luck with the masses. Donna, that’s one thing my publisher has done very well with my books. The covers are pretty awesome, featuring gorgeous young women (they’re on my website). But that makes them also mostly appeal to girls I think. You’re right though, covers are very important when it comes to marketing books to young people. I love the design of the covers on Forge and Chains, but I wonder if they’re too adult focused. I agree. Your cover art is very attractive to girls. Maybe to boys too though they won’t admit to it. As a middle school English teacher, I would keep in touch with what the other teachers were teaching about each week. Every Monday I would share a book or two with my students that I recommended, and then every Friday, I would share a historical fiction book that related to what they were learning in history, or a non-fiction book that related to what they were learning in science or history. That usually got students a lot more interested in reading historical fiction (excuse me, historical thrillers), especially books that dealt with the Holocaust or World Wars or something they were interested in. I think where historical novels get a bad rap is that kids feel they’re written to prove a moral they’ve already heard a hundred times, rather than what the best are – which is busting open the myths of what we think we know of our history. And about fantasy, I’ve often recommended Clavell’s “Shogun” in fantasy forums because it fits the bill exactly – a person finds themselves in an unfamiliar land with strange language and customs, there’s constant warfare with armor and arrows, there’s swords imbued with magical properties, and there’s romance and treachery and assassins and power struggles for absolute control of the land. And yet the whole thing is based on what actually happened, and it layers in so much history one didn’t know before while keeping you in rapt attention. I would hesitate to slap the term “historical thriller” indiscriminately on any story set in historical times in an attempt to make it sound sexier. To publishers, an historical thriller is the modern (and preferred) version of the historical mysteries of days gone by. The modern reader wants more fast-paced action, immediacy and, frankly, blood and gore than historical mysteries have traditionally offered readers, so publishers are requesting fewer historical mysteries and more historical thrillers. What’s the difference? Historical mysteries are slower, less gory, less intense. So is there a macabre body at the start of the story? Is the pace fast and are the stakes high enough to warrant the ‘thrill’ in the term “historical thriller”? For instance will more people die in bizarre ways if the protagonist fails to bring the antagonist to justice? Is there a supernatural element, whether real or imagined? If we start misusing terminology everyone will get confused and this does no one any favors, least of all the misled reader. Call it what it is. Your writing is fabulous enough to revive historical fiction as a genre! You are the author that put historical fiction on the map for me! I was mesmerized by Fever 1793 and still recommend it frequently. Chains was no less dazzling! I had a huge waiting list for it after my last booktalk with students! Historical fiction has the potential to be not only great literature but informative in a non-talky/lecture’ish kind of way. If my social studies and history teachers had been storytellers, the classes would have made much more of a lasting impact on me! History belongs in the hands of storytellers and you’re one of the best! Thanks for your versatility! Can’t wait to read the next one! Next PostNext FORGE earns Star #3!